Does President Obama Know When To Say When? : It's All Politics From The View to the Oscars, Barack and Michelle Obama's regular appearances on talk shows and at sports events raise the question of whether even a president can become overexposed. 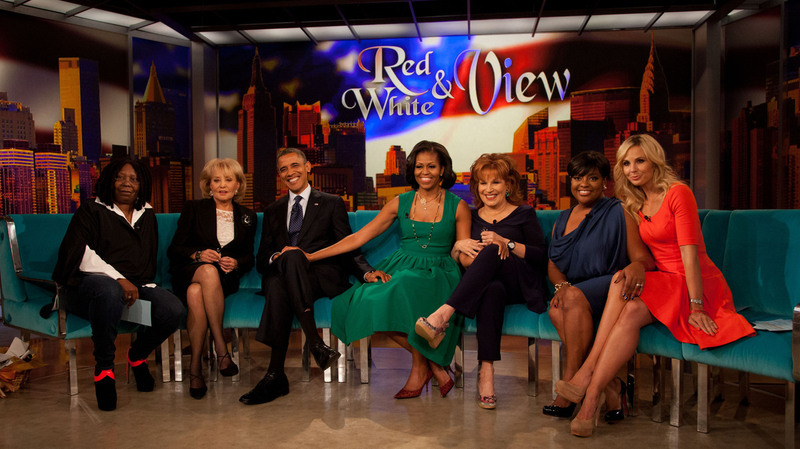 President Obama and first lady Michelle Obama posed with the ladies from The View during an appearance on the show last fall in New York. Doesn't the president get enough attention? The president is always the star of the show. When just about any major event occurs — whether it's a downturn in the unemployment rate, a natural disaster or some crisis overseas — much of the news media ask how it's going to play out for the president, the central actor in our national drama. But then there are additional moments when the president injects himself into non-news contexts. President Obama, in particular, seems to be fond of appearing in as many pop culture venues as possible, whether it's The Daily Show or The View. A lot of that has to do with chasing after a fractured viewing public wherever it can be found. It's no longer enough to grant interviews to the anchors of the major broadcast networks. "If he pops up on American Idol or a Super Bowl halftime show, this is just a president in the modern era trying to talk to a whole constituency of audiences by going all over the place," says Robert Thompson, a professor of pop culture at Syracuse University. But Obama has been eager and willing to appear in so many different forums that it raises the question of whether it's possible, in the modern media age, for even a president to become overexposed. "You get this sense that you can't turn on the television without one of the Obamas on it," Thompson says. After first lady Michelle Obama appeared on the Oscars, just a couple of days after dancing with Jimmy Fallon in a performance that went viral, even fans of the Obamas thought there could be a chance that familiarity could breed disquiet, if not contempt. "There is a point at which you cannot get away from the president or the first family," says Gene Healy, a Cato Institute vice president and author of False Idol: Barack Obama and the Continuing Cult of the Presidency. "They're over every TV at the gym, whether you wanted to tune into politics or not." In a sense, there's nothing new about what the Obamas are doing. Presidents and first ladies have been celebrities throughout American history. "In the context of the popular culture of the 1930s and 1940s, Eleanor Roosevelt was everywhere — on the radio, in newspapers and magazines," says Carl S. Anthony, author of several books about first ladies and the White House. This dynamic might seem exaggerated with President Obama, if only because he's in power at a time when the number of media outlets has just exploded. Reddit, for example, didn't exist until 2005. But when Obama took questions on the social media site last August, more than 5 million people read the discussion and it was covered heavily by traditional media. That highlights a problem maybe only presidents have. An author touting a book or an actress promoting her film will appear on as many shows as possible, to get the message out. But when Obama tries to talk to young people via social media, or to women by going on The View, anything he says may echo loudly on news broadcasts and online. You didn't have to watch the Fallon show to have the video of the first lady dancing forwarded to you. "He goes on things to collect these different demographics, and most people end up seeing every one of them," says Thompson, the Syracuse professor. "Just because you're not in the demographic that watches The View doesn't mean you're not going to see Barack Obama on The View." Conservatives have complained about Obama's "celebrity" factor since he emerged on the national scene. They're already unhappy having to watch this president give the State of the Union address, so naturally they get irked seeing him turn up on ESPN to share his college basketball picks. This feeling can start to apply to liberals, as well. They may find it charming when the president sings an Al Green song or makes the "I'm not impressed" face with gymnast McKayla Maroney. 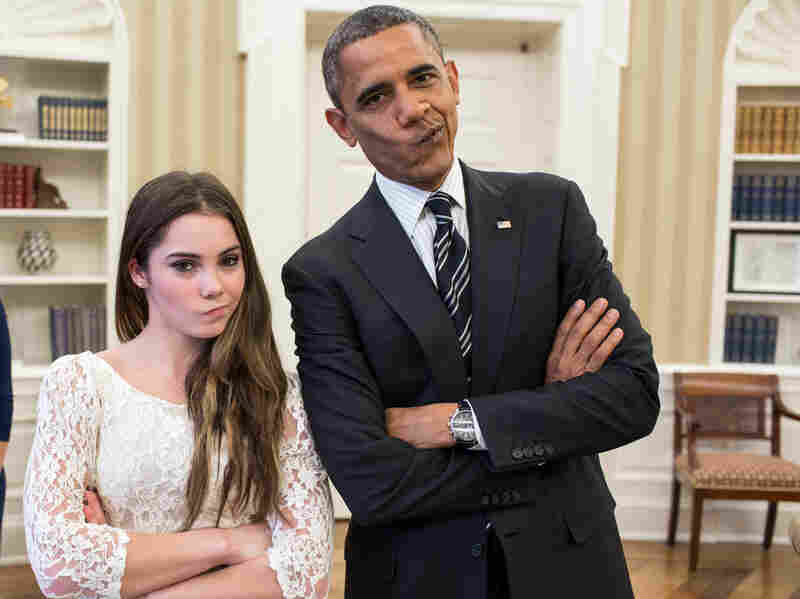 President Obama and Olympic gymnast McKayla Maroney strike her "McKayla is not impressed" pose at the White House in November. But even fans want some level of separation between celebrity and state. "I just want my Oscars to be Oscars, a few hrs not abt politics or the WH," tweeted Betsy Gleick, the executive editor of People magazine. We've gotten used to presidents and presidential candidates appearing on Saturday Night Live or discussing their underwear choices on TV. "We live in a world where pop culture means more than political coverage," says John Powers, a critic for Vogue and NPR's Fresh Air. Still, high-profile politicians have to tread a fine line between appearing to be just like us and being better than us — capable of taking on the enormous challenges of office. "This is a very serious time right now for the U.S., with the budget and sequester," says Justin Vaughn, a Boise State University political scientist. "And it looks like nobody is doing anything except being on the Oscars and talk shows." The pop culture appearances might not always sit well with people, Vaughn suggests, because they're part of a larger issue the Obama administration has with transparency. Recently, there have been flaps about the president not granting the media access to his golf game with Tiger Woods, as well as a lot of attention paid to the question of whether Bob Woodward of The Washington Post felt he was being pushed around by a White House aide. Those both turned out to be minor controversies. But Obama does seem to have a preference for giving interviews to talk show hosts or small regional newspapers, which might ask less challenging questions than reporters from, say, The New York Times. That coincides with complaints from members of Congress that he spends too much time at campaign-style rallies, rather than negotiating with them. In other words, the president isn't playing enough of a Washington game to satisfy Washington. The omnimedia approach of this White House doesn't sit well with its critics. "Clearly, the Obama people have made the decision that they're trying to go out to the public over the head of both Congress and the media," Powers says. "Obama's particular problem is that he can simultaneously seem overexposed and aloof." What Obama is trying to do is reshape the bully pulpit to fit his era — a time when it's necessary even for a president to chase after a mass audience. Finding the right balance between trying to mold public opinion out in the country and appearing to be always fully on task in the Oval Office is an ongoing maneuver. "If people were enthusiastic about government and politics, they would watch C-SPAN, but they don't, so you kind of have to reach the audience where they are," says Matthew Eshbaugh-Soha, author of Breaking Through the Noise: Presidential Leadership, Public Opinion and the News Media. "I have no doubt that the White House thinks about this and wants to find the sweet spot in a variety of media," he says.